A 36-year-old carpenter in Bunkprugu in the Northern Region James Jabik has been shot dead by soldiers on peace keeping mission in the area. 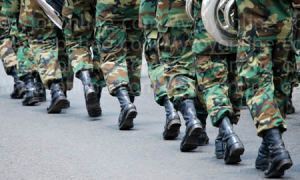 The military accused the deceased person of breaking curfew which was imposed last week following violent clashes that left two people dead. Narrating the circumstances surrounding the attack, a brother to the deceased, Dickson Labik told Joy News fully armed military men surrounded the house in which the deceased was living, a situation that created fear and panic. According to him, residents including the deceased went hiding in their rooms when they noticed they had been surrounded. “All of us went into hiding in our various rooms. His wife and children were in the room. When they came they entered and pulled the woman and children out and saw the man hiding in between some sacks of maize. They dragged him out and shot him”.